Personal URLs (PURLs) are an extremely effective form of marketing, doubly so for real estate mailings. Just what are PURLs? Think of them as a personal website that’s been set up to capture direct or email campaign responses. They’re easy to use and can be customized using content specifically targeted to each recipient’s personal needs or interests. PURLs work so well because they add a personal touch to advertising and marketing. Real estate mailings in particular have a lot to gain from adopting a highly individualized approach. As easy as 1-2-3, personal direct advertising turns your marketing campaigns into dynamic interactive experiences. Real estate mailings you send out include a unique landing page for each person on your list. Recipients are directed to visit a personalized site with their name on it. Once they land on their page, clients or prospects can answer questions, take surveys, register for private showings, link to your website and more. Create compelling content that captivates your audience and delivers relevant information. Make sure the PURL is prominently displayed and includes a CTA that promises something of value when the site is visited. Set up your mailing list with variable data, such as buyer, seller, property location, etc. Set up a domain and program for generating the PURLs and adding them to your data. Design your landing page, including things like survey questions and data gathering forms. Send out your real estate mailings and then track your campaign activity via notifications and reports. Results can then be analyzed to see how well a particular campaign performed. You can also use the generated reports to compare it to past campaigns. Harness the data you collect and use it for lead generation and designing subsequent campaigns. When done well, PURLs will impress your contacts, increase your response rates, and help you effortlessly manage customer relationships. 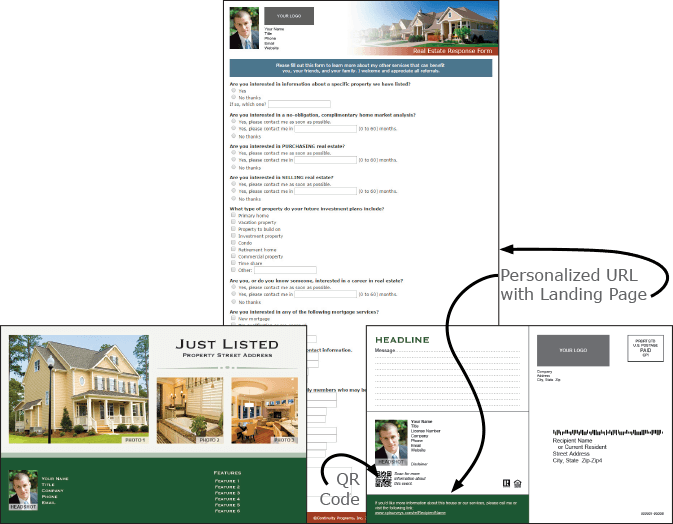 Here are some examples of real estate mailings that include PURLs.